Aglianico is one of those rare and slightly obscure varietals that too infrequently make the light of day in a place like Vancouver, British Columbia, over 9000 km away. Aglianico is both the name for the volcanic soil and the grape which is grown to greatest success upon it... indeed, the most prized vineyards in the province of Potenza, Italy are in the Vulture area; standing in the shadow of the extinct volcano by the same name. And Aglianico has been grown here for not just years, or even centuries, but millenia: thousands of years. Originating in Greece (presumably), the grape has had a long and illustrious career here in the south of Italy, even becoming part of the world's original First Growth wine: Falernian. 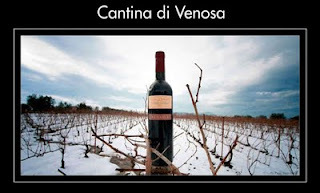 Now Aglianico has found a new champion in Cantina di Venosa, a co-operative started in the 1950's in the Aglianico del Vulture D.O.C. which gained it's D.O.C. status in 1971. The grape is certainly the backbone of their production as the vineyards have an unobstructed view of the not-so-distant volcano. Since the 50's the co-operative has grown from only a handful of members to over 500, and yet has remained true to it's original mandate of preserving quality over quantity, and protecting the uniqueness of their prized varietal. 2007 Vignali Aglianico del Vulture D.O.C.